Nazi Germany is the period when Adolf Hitler's Nazi Party controlled Germany. It is also sometimes called the Third Reich (German: Drittes Reich), which means the 'Third Empire' or 'Third Realm'. The first German empire was the Holy Roman Empire. The second was the Second German Empire of 1871 - 1918. The Nazis said they were making the third. However, the term 'Third Reich' was more popular in other countries. In Germany it was merely The Reich (pronounced 'rike') or the Greater German Reich (German: Großdeutsches Reich). ^ Officially "Großdeutsches Reich" ("Greater German Reich"), 1943–1945. ^ Officially "Großdeutscher Reichstag" ("Diet of the Greater German Reich"), 1938–1945. Adolf Hitler led Nazi Germany until it was defeated in World War Two in the Battle of Berlin, when he killed himself in 1945. The Nazi Party was destroyed in the same year as its leaders ran away, were arrested, or killed themselves. Some were executed for war crimes by the Western and Soviet powers. Others survived, with some of them getting important jobs. However, their racial policies never again held power in Germany. The Nazi government was formed under the idea that some races were better than others. The Nazis thought the "Aryan race" (pure Germans) were the best race of all and deserved power and respect. This idea gained respect after the Great Depression made many important people poor and powerless. Hitler blamed the problems on Jewish capitalists and communist gangs. He was able to make Germans feel like they were innocent victims who had to take charge over Europe. When the Nazi regime was destroyed at the end of World War II, Germany was split into four "occupation zones". The Soviet Union took East Germany. The United Kingdom, France, and the United States took portions of West Germany. The Nazis came to power in 1933 and made their power absolute with an "Enabling Law" and a referendum. They centralized Germany, replacing local self-government. They immediately banned Jews from important jobs, and soon restricted them in other ways. After a few years they built the armed forces far beyond the limits of the Treaty of Versailles. On September 1st, 1939, German forces attacked Poland, which began World War II. With over a million troops, Hitler's army easily took over Poland, while losing just around 59,000 soldiers. Poland lost over 900,000 soldiers, because their army and weapons were not as good. On October 12, 1939, Hitler sent a letter to the United Kingdom promising peace. The British continued the war. Hitler conquered France in the Battle of France. Then he sent the Luftwaffe to attack England. Winston Churchill, now Prime Minister of the United Kingdom, did not surrender. The Battle of Britain lasted from July to October 1940. When it failed, Hitler ordered the mass bombardment of London. That also failed, and Hitler decided to face east for his racial war of destroying the Slavs and Jews. This gave Britain time to regain power. In 1941, Hitler ordered "Operation Barbarossa." It lasted from June 22, 1941 until December 5, 1941. Joseph Stalin, the leader of the Soviet Union, had weakened his army with his Great Purges, which had killed many Russian officers before the war. During Operation Barbarossa, many more Soviet soldiers died than Germans. At Stalingrad, however, about a million soldiers died on each side. While the Soviet Union could replace its losses, Germany could not. After Stalingrad, the Germans lost their momentum. The Soviets learned from the long campaigns, fought better, and gained many new weapons from very efficient factories. The United States, Britain, France, and the Soviet Union fought together, and pushed against the smaller German army. In May 1945, they took over Berlin to win the war. Around one million German soldiers. About one million French, British, and American soldiers. About 5 million German soldiers, and soldiers from other fascist countries died. About 7 million Soviet soldiers died fighting against them. About 2 million Soviet soldiers died in Nazi concentration camps and prisoner of war camps from starvation, disease, freezing to death, and executions. About 10 million to 15 million Soviet civilians died from famine, executions, and the Holocaust. After the Allies took over Germany, the Soviets set up the German Democratic Republic. It was a socialist state that followed communism. The United Kingdom, the United States, and France set up the Federal Republic of Germany in the west. It was a democratic country. When the Nazis took over Germany, most people in the country were Christians. The Nazis wanted to change the way people thought, and they did not like the Christian Churches. They closely watched priests, and often arrested or punished them. By 1940, priests from all over the Nazi Empire were being locked up together at Dachau Concentration Camp. Nazi leaders like Martin Bormann, Joseph Goebbels, Heinrich Himmler, and Alfred Rosenberg, backed by Hitler, eventually wanted to destroy Christianity. Himmler and Rosenberg had some pagan ideas. Others, like Bormann, were atheist. Hitler himself hated Christianity, but he knew it was important in German politics and culture. Because of this, he usually said he wanted to wait until after the war to get rid of the Churches. The Christian Churches were treated badly by the Nazis, but smaller religious groups, like the Jews and the Jehovah's Witnesses, were treated far worse. The Nazis tried to kill all of the Jewish people in Europe. They sent people of other religions, like Jehovah's Witnesses, to concentration camps and death camps. The Nazi campaign against the churches was called the Kirchenkampf. The Nazis tried to take over the Protestant Churches of Germany, by bringing them together in a Nazi-friendly National Reich Church. Some Protestants supported the idea. However, when the Nazis tried to change the Bible to say Jesus wasn't Jewish, a group of pastors started the Confessing Church. The Confessing Church did not support Nazi ideas about controlling religion or changing the Bible. The Nazis made the Church illegal and arrested hundreds of its pastors. Hitler did not like the Catholic Church, and was worried about its influence on German politics. In 1933, his new government signed a treaty (the Reich Concordat) with the Vatican. The treaty promised to let Catholics control their own Church, but said priests could not do politics. However, Hitler then closed down every Catholic organisation that was not a church - like Catholic political parties, groups for young people, trade unions, and newspapers. He murdered some of the leaders of these groups, and eventually closed all Catholic schools. Then the Nazis started attacking priests and nuns, and arrested many of them. Pope Pius XI protested strongly in Mit brennender Sorge (a 1937 papal encyclical), which said that Nazi ideas like racism were bad, and that the Nazis were persecuting the Church. Many Germans were angry that the government was interfering in their churches, but others did not care too much. A few tried to stop the government from killing religious minorities like Jews. Church leaders tried to stop the Nazis from interfering in their religion. Because they kept some independence from the state, they could publicly disagree with some government policies. For example, Catholic Bishop August von Galen and Protestant Bishop Theophil Wurm protested against the Nazis' program of killing disabled and sick people. Some religious leaders, like Martin Niemöller, spoke up for human rights in Germany. Several priests and pastors were executed for helping the 1944 plot to overthrow Hitler, including Pastor Dietrich Bonhoeffer and Fr. Alfred Delp SJ. ↑ Anton Gill; An Honourable Defeat; A History of the German Resistance to Hitler; Heinemann; London; 1994; pp. 14-15. ↑ 6.0 6.1 Blainey, Geoffrey 2011. A short history of Christianity. Viking, pp 495-6. ↑ "Martin Niemöller"; Encyclopedia Britannica. Retrieved 25 August 2013. ↑ Including de facto annexed/incorporated territories. 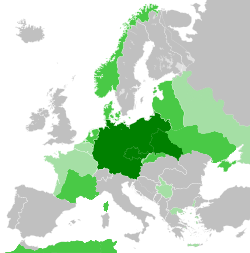 ↑ In 1939, before Germany acquired control of the last two regions which had been in its control before the Versailles Treaty—Alsace-Lorraine, Danzig, and the Polish Corridor—its area was 633,786 square kilometres (244,706 sq mi). See Statistisches Jahrbuch 2006. ↑ Die Bevölkerung des Deutschen Reichs nach den Ergebnissen der Volkszählung 1939, Berlin 1941..